Next week, Meghan Markle and Prince Harry will embark on an epic two-week trip to Australia, New Zealand, Fiji, and Tonga. (We've already outlined all the need-to-know details, including their full schedule.) In honor of the impending royal tour, we decided to throw it back to Princess Diana's memorable visits Down Under—you know, just in case Markle was looking for some outfit inspo. Princess Diana visited Australia for over a decade, beginning with her first royal tour of the country in 1983 (two years after her wedding) and ending with her final trip in 1996. In between, she seemingly saved her best looks for her Aussie trips, from a very on-trend puff-sleeve dress to a sleek statement coat. Scroll down to see the best outfits Princess Diana wore in Australia and shop the 2018 versions of each look. 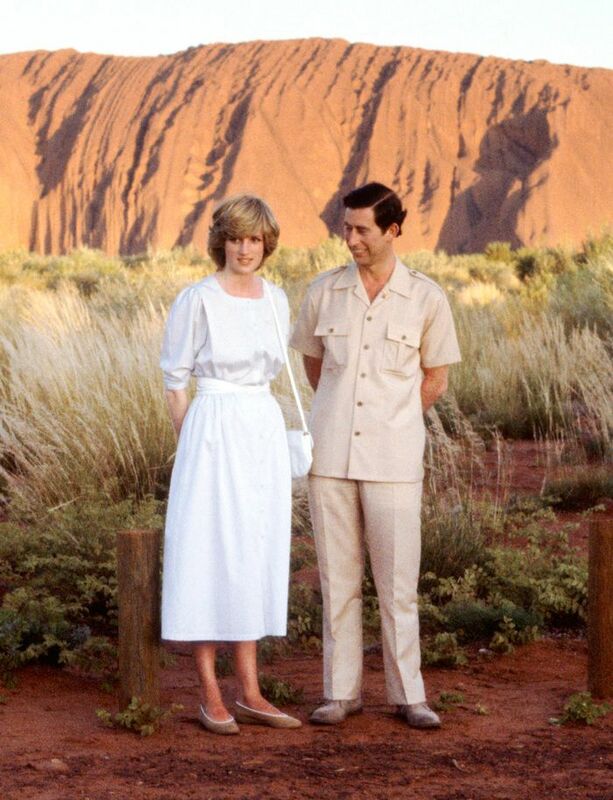 Princess Diana and Prince Charles posed in front of Ayers Rock in 1983. The People's Princess posed with lifeguards at Terrigal Beach in 1988. Princess Diana was photographed on her 1988 tour of Australia. Princess Diana and Prince Charles took a stroll in the Royal Botanical Gardens in Melbourne in 1985. Princess Diana met with schoolchildren in Alice Springs, Australia, in 1983. Princess Diana wore a pastel skirt suit during her final trip to Australia in 1996. Princess Diana was photographed at the National Gallery in Melbourne in 1985. Lady Di looked pretty in pink in Perth, Australia, in 1983.